The updated and improved Sigma X range of motor-driven metering pumps have proved themselves more than a million times. The products come with an integrated CANopen interface. The recently launched motor-driven metering pump features a CANopen interface for connection to process management systems as well as to Bluetooth or Wi‑Fi networks. The Sigma X therefore enables monitoring, analyzing, and optimizing metering processes. This minimizes the consumption of raw materials used, operating errors, and down times. At the same time, the customer service is improved through networking, transparency, and automation, and the timely delivery, maintenance, and repairs on site are ensured. The operating concept with click wheel and four additional operating keys on a removable operating unit represents a highlight of the new Sigma X, stated the supplier. An illuminated LCD and an LED display for various operating statuses provides additional operating convenience. The timer controls time-dependent metering processes. Relevant spare parts are shown on the display. 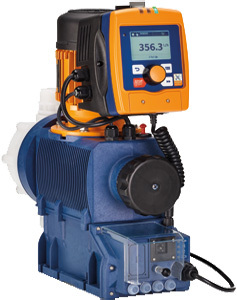 The motor-driven metering pump with integrated control uses a patented multi-layer safety diaphragm. An integrated relief valve protects the pump from overload and its bleed option guarantees reliable operation throughout the metering process. The product delivers optimized metering results, due to its adjustable metering profiles. The series supports measurements in the range of 21 l/h to 1,040 l/h. The combination of frequency and stroke length adjustment permits a large adjustment range, with the pump working with precision over the entire frequency range. Adjustment of the movement profile also guarantees precise and trouble-free metering even with viscous and gaseous media.